Experience that open top feeling in style with the new BMW 4 Series Convertible. Its flowing lines, dynamic silhouette and aerodynamic design enhance the sporting elegance of this stunning new convertible. 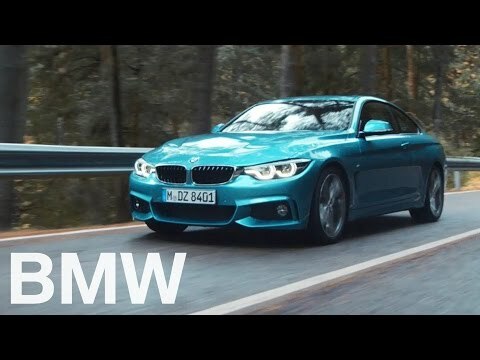 Somewhat larger than the outgoing 3 Series Convertible, the 4 Series features a retractable hard top that can be folded away in 20 seconds, even while the car is in motion. The roof on the new 4 Series Convertible has an entirely new design, with enhanced sound-proofing and improved aerodynamic efficiency which helps to reduce any wind noise when the roof is raised. Style-wise, the exterior is very like that of its sibling, the 4 Series Coupé. With the same front end and rear light-clusters, the main difference on the Convertible model is the elevated roofline and horizontal boot which offers an additional 20 litres of space and has been designed to house the new folding top. All models feature a new loading assistance system that repositions the folded roof within the boot to let the driver maximize the full 220 litres of available space when the roof is stowed away. As with the Coupé, the standard kit will be quite substantial on Convertible models including xenon headlights (with full LED lights available as an option) and comforts like heated electric front seats and front and rear parking sensors. The 4 Series Convertible will be available in five different trim levels; SE, Sport, Modern, Luxury and M Sport. All models will include BMW EfficientDynamics, a series of innovative technologies that help to reduce emissions and increase economy. Features on the 4 Series Convertible include low rolling resistance tyres and Air Curtains and Breathers. Likewise, the 4 Series Convertible echoes the same interior as that of the Coupé. Its elegant ambience is designed exclusively with the driver in mind and displays excellent comfort, ingenious functionality and a high level of standard specification. For the first, time neck warmers for both front seats are available as an additional extra and the optional redesigned air blocker is more straightforward to use and appears more effective at decreasing buffering. This model will be offered with three engine options – two petrol and one diesel. The entry level model is the 420d powered by a 181bhp 2.0-litre our-cylinder turbo diesel, while the petrol versions include the 428i with a 242bhp 2.0-litre turbocharged four-cylinder, and a top-spec 435i which uses a 302bhp 3.0-litre turbocharged straight-six engine. While the 4 Series Convertible will come with a six-speed manual gearbox as standard. It is thought that the most popular version of this vehicle will be the eight-speed sports automatic with steering-wheel-mounted paddles, as this version will return 37.7mpg and emit 176g/km of CO2. Ultimately offering more fuel efficiency than that of the six-speed manual, irrespective of engine choice.